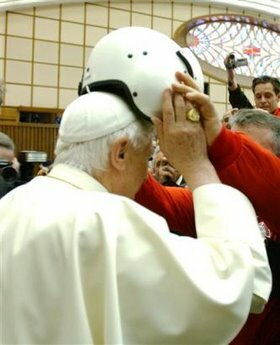 One of the readers -- who obviously knows of which he speaks -- sent along this photo with the already- legendary caption: "Pope Prepares to Meet Parishioners of St. Blog's." Suffice it to say, the old boy didn't need anything like this when Hans Kung dropped by. And he seemingly wouldn't need it if the Mormons or Pagans came to visit, either.